During day time you will take shelter in a ruined tenement house, which you will care about and manage by: removing rubble, searching through various rooms (often behind barricaded doors), you will build beds, improvised workshops, stoves, tools, water filters, small animal traps, you will cultivate an improvised vegetable garden, fix the tenements� shelled facilities, reinforce the security of your shelter and should winter come, you�ll try to keep it warm. The boardgame significantly broadens the original game�s universe and emphasises the depth of plot, yet its main focus will be on human interactions driven by survival instinct and group decision-making. 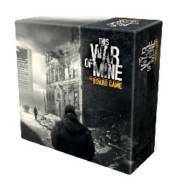 The project aims to omit the usual boardgame threshold - TWOM: The Board Game is an INSTANT PLAY game, with no need for reading the manual before starting the adventure.